Endodontists are dentists who specialize in maintaining teeth through endodontic therapy or root canals. In addition to dental school, endodontists receive two or more years of advanced education in this kind of treatment. They study root canal treatment and procedures in greater depth. 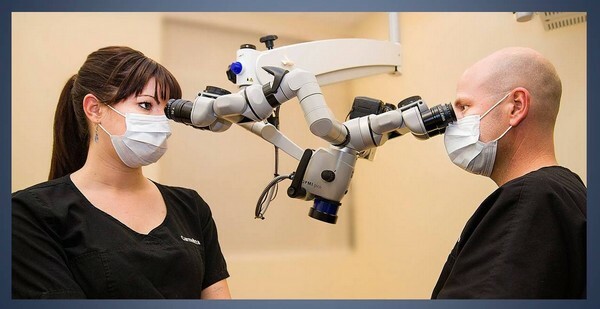 Endodontists are specifically trained in the use of the dental operating microscope, which is often essential to achieving a successful endodontic outcome. For this reason, many dentists choose to refer their patients to an endodontist. Endodontic therapy, or a root canal, is one of the most common dental practices with well over 14 million preformed every year. This simple treatment can save your natural teeth and prevent the need for replacement. Root canal therapy has a very high degree of success, often well above 90% depending on presenting factors. We will discuss with you the chances of success before any endodontic procedure to help you make an informed decision. In the center of your tooth (root canal space) is the dental pulp. 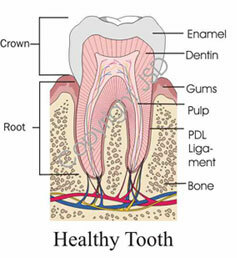 The dental pulp is a collection of blood vessels, nerves and lymphatics that help build the surrounding tooth. Inflammation and/or infection of the pulp can be caused by trauma to the tooth, deep decay, cracks, chips, or dental procedures. 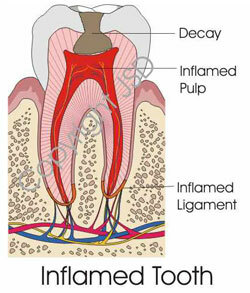 Symptoms of inflammation or infection can be identified as visible injury to the tooth, swelling of the tissues surrounding the tooth, sensitivity to temperature, or pain in the tooth and gums. If you experience any of these symptoms, your dentist will most likely recommend nonsurgical root canal therapy to eliminate the diseased pulp. This injured pulp is removed and the root canal system is thoroughly cleaned using instruments and cleaning solutions. The canal space is then filled with an inert filling material such as gutta percha. This treatment involves local anesthetic. The number of treatment sessions required to treat your tooth depends on the degree of infection and the complexity of the case. Oral pain such as toothaches or cracked/fractured teeth can often be difficult to pinpoint. Due to the vast network of nerves in the mouth, the pain of a damaged or diseased tooth often is felt in another tooth and/or in the head, neck, or ear. An endodontist is a specialist in diagnosing and treating this type of pain. Pulp damage is sometimes caused by a blow to the mouth, and an endodontist specializes in treating these traumatic injuries. For example, a blow to a child's permanent tooth that is not fully developed can cause the root to stop growing. A procedure called apexification stimulates bone to be deposited at the end of the root which makes it possible to then save the tooth through a root canal procedure. An endodontist is specially trained in procedures for replanting teeth that have been knocked out of their sockets. Once endodontic therapy is completed your tooth should be examined periodically, usually every 6-12 months. This allows us to make sure the tooth has healed or is healing properly. Since an abscess may take 2 years to heal, our office will reevaluate the tooth for at least 2 years. Occasionally a tooth that has undergone endodontic treatment fails to heal or pain continues despite therapy. Although rare, sometimes a tooth initially responds to root canal therapy, but becomes painful or diseased months or years later. When either of these situations occurs, the tooth often can be managed with a second endodontic treatment to make it comfortable.